You've got your Eisners, you've got your Harveys, you've got any number of fan awards and recommendations, but I'm here to tell you that your best bet -- your absolutely greatest, guaranteed-to-be-a-great-read, not-really-even-a-bet -- comics are going to be the ones that have won a Xeric. These are books that are published by truly talented folks, regardless of the subject matter. Masters of the craft of sequential art. You're getting great stories told extremely well. And you have the added bonus of looking smug when you're talking about comics to other folks because you've read great books that, for some inexplicable reason, tend to fall below the radar of even that class of comic snobs who read books from Fantagraphics. 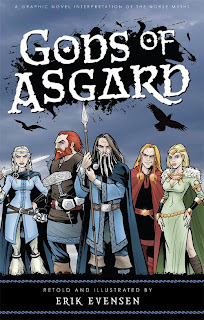 So it should come as no surprise that I enjoyed 2007 Xeric winner Gods of Asgard by Erik Evensen. I enjoyed it a lot. Seriously. A lot. Best comic I've read in quite a while. The only real complaint I can muster is that I didn't talk to Evensen more when I bought it from him at this year's Mid-Ohio-Con. The book itself is a collection of stories from Norse mythology, starting with their Creation legend and ending in Ragnarok. The tales are broken up something like chapters according to the original legends, with each individual legend running somewhere between five and ten pages. Each story also pretty well stands on it's own; and Evensen doesn't try to invent connections between them, just as the original legends (or, at least, what survives of them) didn't have connections. Many of the stories I knew, after a fashion, thanks to Jack Kirby and Walt Simonson but those versions are colored (tainted?) by the surrounding superhero stories marvel published/publishes. Evensen's interpretations are not hampered by any of that, and he's clearly put a lot of time and effort into researching the original versions and tried to keep them as true as he can to what the ancient Norse would've actually told each other. He's even included his bibliography and several pages of notes on how he depicted characters or scenes. One of the first things I noticed about the book was the character designs. While there are certainly some characters that show up more frequently than others, the cast on the whole is pretty large. With a "main" cast of around 20, it's important that each of them are visually unique. While this shows up in many comics -- especially ones with larger than life stories like this -- Evensen's characters are identifiably unique in their faces, not just their overall appearance. A Jack Kirby Thor, for example, is fairly indistinguishable from his Kamandi except for the clothing. Evensen's characters, though, are all unique and are still readily identifiable when they change clothes, put on armor, use an assumed name or what have you. No small feat, even with a small cast, but Evensen keeps things tight visually throughout the whole book. The only other comic artist I can think of offhand that I've known to be able to pull that off is Goseki Kojima. Further, while the original stories aren't exactly laden with continuity, Evensen makes visual nods to it throughout the book. For example, an early story about Loki ends with his lips literally sewn shut. And throughout the remainder of his appearances, there are scars clearly visable around his mouth. Likewise, gifts that are given to characters are seen, even if they're not mentioned, in subsequent stories. It's nice touches like that that kick the book's overall high quality of the art to another level. The script/dialogue was interesting. I admit that the Norse gods I grew up on were the ones that spoke in a faux-Shakespearian accent thanks to Stan Lee, and I suppose I have some tendency to expect that in comic books about Thor or vikings or what-have-you. Evensen smartly avoids that and uses contemporary English, but he has it written in such a way that, although it gives no overt hints at it being an older dialect, it still reads in a somewhat more historical manner. I haven't checked closely, but I suspect it's in part because he doesn't use contractions. That gives something of a more formal air about the language, thus making it seem to come from a different time. What's also interesting about the script is that Evensen doesn't flinch at all when it comes to social mores that don't necessarily translate across the centuries. He presents the stories and characters react to situations as those stories were told, regardless of what might be a more acceptable/believeable reaction in today's world. What upsets the characters might not upset your or I, and what upsets us might not affect them. What struck me as I read the book, and as I'm writing this, is that I have to keep reminding myself that this is all fiction. The stories never happened. If you read something like 300, you have to assume that it's at least marginally fictionalized but it's still based on a true story. I keep wanting to think that about Gods of Asgard even though I know consciously that the original stories Evensen is drawing on were fiction in the first place. I think that speaks to the "truth" of the original legends and Evensen's work here today. No, the events did not actually take place but the stories touch on everything that makes us human in every true sense of the word. It's that "truth" that comes out in Gods of Asgard and I think says a lot about Evensen's abilities as a storyteller. Thanks for the review AND the awesome blog. Love your sharing of the childhood geekery. If you get the chance, check out my own geek blog, Pop Goes the Icon, at http://bleedingneon.typepad.com/pop_goes_the_icon.